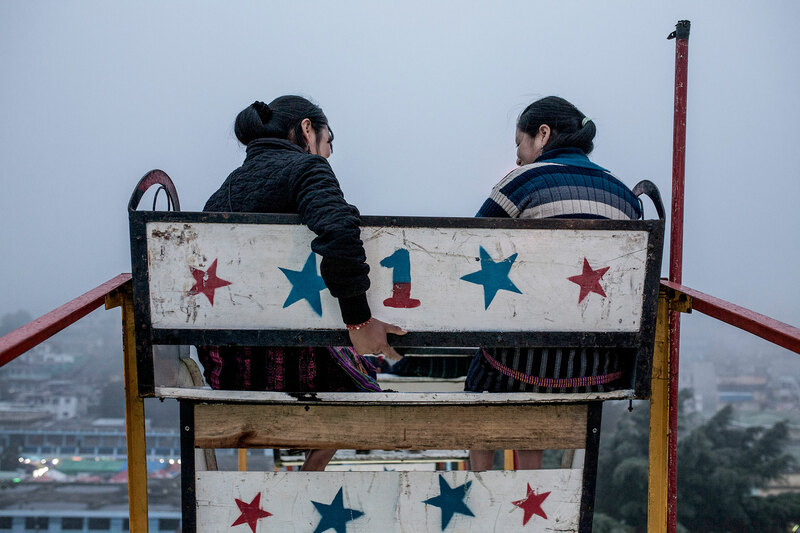 The images captured at the Sololá Festival are a burst of hope and colour amongst hardship. The festival is in the large town of Sololá and everyone from smaller neighbouring towns make the journey by foot or bus. It’s an annual highlight and people wear their best. A band of young men had been rehearsing the same song repeatedly with flutes, drums and guitars outside Karina’s window ahead of the festival. She’d wondered what they were preparing for, but upon arrival found the main square filled with music and dancing. The carnival rides were originals from the 1950s. In the early night, we see people colourfully illumed by the glow of their lights. Digital Photography on fine art textured cottom paper.